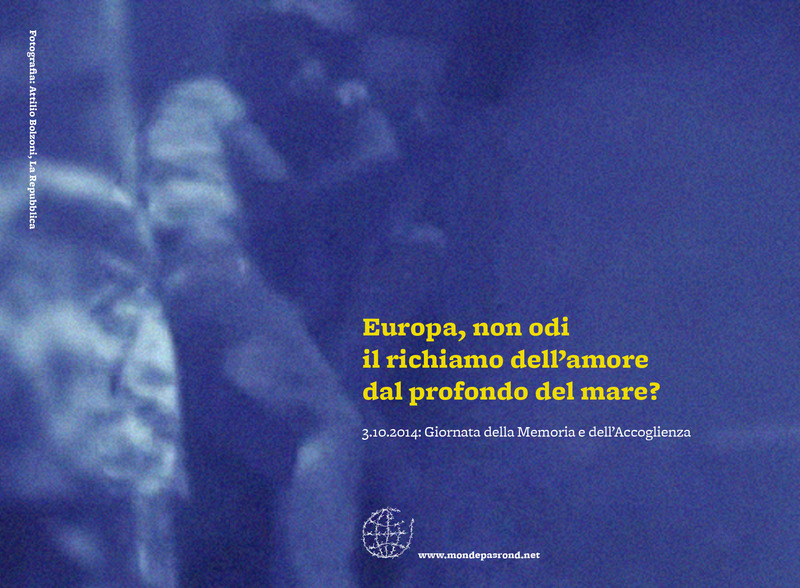 Friday 3rd October 2014 marks one year since the tragedy off Isola dei Conigli, Lampedusa, a shipwreck in which 366 people lost their lives – men, women, children, and a newborn baby still attached by the umbilical cord to his 20-year-old mother. Associations across Italy have declared 3rd October as the Giornata della Memoria e dell’Accoglienza (Day of Memory and Hospitality), and are commemorating the occasion with a number of events. In memory of the lives lost in that shipwreck, of the 3,072 who are known to have drowned in the Mediterranean this year alone, and of the around 25,000 disappeared at sea over the past decade, Le monde n’est pas rond is publishing the haiku below in several languages. The image and haiku are also a short, sharp message to those who have the power to radically shift the European migration and border policies away from an approach based on fear, and towards a spirit of hospitality and respect for fundamental human rights. Mediterranean islands are no longer what they used to be – every summer, they double up as giant tombstones in the collective Mediterranean cemetery. Last May, La Repubblica published the above photogram, taken from a video recorded by police divers off Isola dei Conigli. A heart-wrenching image, which perhaps should not have been published, yet somehow, it is also heartening. To die alone is perhaps one of our profoundest fears. The embrace is a powerful symbol: borders, built according to a policy of fear and hate, may continue to separate people or even murder them – and yet, love prevails. Perhaps it was insensitive of La Repubblica to publish the police divers’ video, even if it appears care has been taken to ensure that faces are not recognisable. For survivors of this shipwreck and others, the footage will no doubt be traumatic. Perhaps it is insensitive of us also to republish this photogram. Aditus, a Maltese human rights NGO that I highly respect and follow, has condemned the dissemination of the video as a disrespectful invasion of privacy, and I see their point. Working closely with migrants in Malta, they may have witnessed someone’s distress at the publication of the footage first-hand. The damage may be done, but it’s no justification. As Collettivo Askavusa, Lampedusa declared last Wednesday, every day is 3rd October. Today at 11:30 a.m. they will hold a demonstration at the Lampedusa airport, calling for an end to the militarisation of the island and of other external EU borders, and for the realisation of the ‘humanitarian corridors’ promised by politicians in quick reaction to last year’s tragedy. In the mean time, despite the general climate of racism and indifference, and in the face of governmental policies with an excessive focus on security, private citizens across Europe are taking the initiative to assist ‘irregular’ migrants in any way they can. A recent article by Al Jazeera mentions notable examples in Malta, Austria and Bulgaria. There are hundreds more, large and small yet equally significant, which do not make it to the news. It may take another five to seven generations, but love will eventually pull the borders down. This may indeed be a delusion on my part, and on the part of many other no-border activists and sympathisers, yet I would prefer working towards that delusion, rather than allowing pessimism to clip our wings. If anything, the photograph above, at once frightening and endearing, should continue to embolden and encourage us. Thanks to all of the haiku translators, and to Marco Scerri and Pawlu Mizzi for their help with the images. Haiku (Maltese original and English translation) and text by Antoine Cassar, author of Passport, and co-founder and co-editor of Le monde n’est pas rond. This entry was posted on 03/10/2014 by mondepasrondeditor in activism, editorials, events, photography, poetry and tagged Antoine Cassar, asylum, Bedo Demirdjian, Berislav Blagojević, borders, Elizabeth Grech, EU, Joanna Tsoni, Joke Kaviaar, Lampedusa, Malta, Marco Scerri, Maria Brandt, Mediterranean, migration, Monique Agius, Pawlu Mizzi, Peter Semolič, refugees, Robert Schönrok, Selma Porobic, Silvia Canciani.